InterLok®, Pengo’s recent product innovation, was recently named winner of the cutting/drilling category in RER’s 2017 Innovative Product Awards. 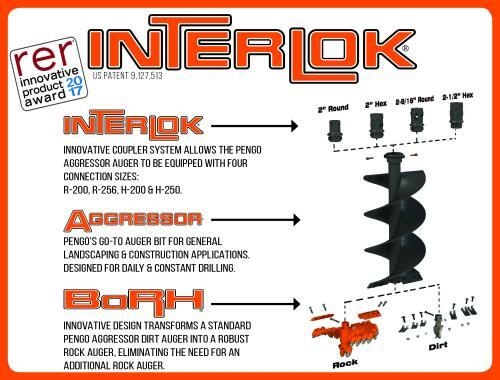 InterLok® is a patented variable geometry auger bit coupler system. Introduced by Pengo in January 2017, this innovative system allows an auger bit to utilize different coupler (hub) connections. The coupler is no longer permanently welded to the auger bit. This eliminates the need for auger bit adapters and allows for different types of auger drives with various output shaft sizes to be used. The system is ideal for the rental customer by reducing inventory but ensuring the right tool for the job.